It may seem obvious, but it's critical that you feel comfortable with an individual who may be working for you. If you do not like to be in his/her presence, why would a client? It goes without saying that people skills are invaluable in this profession; it's what we do! Look for someone who puts you at ease, is warm and inviting, and who you find yourself attaching with. Be mindful of the emotional climate of your practice; you want to bring someone in who will work well with others, avoid drama, and of course help clients through their emotional struggles. Whether or not I genuinely like someone is the most important factor determining if I hire him/her (interestingly, this same criteria is also usually first on the list of what a client looks for in a therapist). Were they born to be a therapist? When looking to add to my practice, I look for individuals who I can sense were born to do therapy. It's common for practitioners to work with a lot of graduate level interns, and there are a select few who truly stand out; people who are naturally thoughtful, reflective, and sensitive to others' needs and feelings. I want someone who's always had the intuition and instinct of a therapist who just had to go through the official training to actually become one. This question is admittedly a bit delicate. While no one has it all together all the time, it naturally follows that someone who has a handle on his/her emotional issues can better assist clients in managing their own. Good therapists often use difficult past life experiences to relate to and help clients, so being "emotionally stable" doesn't necessarily mean you've never struggled mental health or relationship problems; quite the opposite can be true! To use an analogy, you cannot be a tour guide for other people to places you've never traveled. Still, I need my therapists to be healthy in order to best serve our clients. Do they reflect the values of my practice? As the owner of my practice, I need therapists who work for me to be similar to me in many ways. This is not to say, of course, that I am wanting someone with the exact personality, training, and expertise that I have. Still, there needs to be a continuity of approach and therapy style common to our clinicians. Throughout the years, we've had inquiring individuals wanting to see me specifically after hearing me speak or learning about me through social media. When I don't have an available opening to see someone new, I like to be able to state my confidence in another therapist and tell the prospective client that I've hand-selected a particular counselor that I wholeheartedly trust to do good work. I suggest that practitioners looking to hire new therapists identify a few specific values that are key to the philosophy and setting of their private practice to look for in applicants. What do YOU look for when hiring new clinicians? This post was adapted from an interview I did with Joe Sanok, LPC on" Practice of the Practice." Click here for access to the full podcast. Want to grow your practice and make a difference beyond the therapy office? Check out my NEW Rock The Media School for Therapists - a 6-week online media + social media training designed for health and mental health practitioners. Learn how to build your media and your online presence so you can share your passion and practice with thousands of people! I hope you'll join me. Fall cohort begins Sept. 7, 2015. Tell us about your background (college experience and degree, career beginnings, etc.). Wow, big question. I’ve had a number of careers as I tried to find the one that really fit. I attended USC for undergrad, and then after some years working in the entertainment industry found myself in Palo Alto while my wife was doing her medical residency at Stanford. I was always a bit of a technology geek and really connected with what was happening in Silicon Valley. We eventually ended up back in Los Angeles where I had some success with a number of technology companies. Then one day, I realized how disconnected I felt from the work I was doing and decided that I needed to reconnect with what was important to me, and also that a major career change was part of that. There was a particular school, Pacifica Graduate Institute, that I had always wanted to attend. Pacifica has a unique program where you basically live there for 3 days a month and are immersed in this wonderfully rich world of depth psychology. When I began school there, it felt like coming home. It was one of the most important experiences in my life, and I am very grateful for it. With your business savvy and drive, you could have gone in many different directions. Why did you decide to apply your expertise to the mental health profession? After graduating from Pacifica, I was doing my internship in California, and the Board of Behavioral Sciences (BBS) has very confusing rules for how you need to accrue, track, and report your 3000 hours of clinical experience. After fumbling around with a complex spreadsheet, I realized that this whole process would be better served by a web-based product. So I developed a product called TrackYourHours. It had all the BBS rules and forms built in, and it turned into a very sophisticated piece of software that was simple to use. It caught on quickly, and thousands and thousands of pre-license clinicians now use it. So that was where the entrepreneur in me really kicked in - I saw a need and filled it. How did you come to develop the management system SimplePractice? I was getting close to completing my 3000 hours of training and started to look at practice management products to find one I would want to use. To be honest, I was very unimpressed by what was out there. Products were either outdated and just horrific to look at or too complex for me. I wanted something simple and intuitive. So I decided to build my own. You’ve had tremendous success with your product. Explain some specific things you’ve been able to achieve with SimplePractice. The most important thing for me is that our customers love our product for the reasons we set out to achieve - it’s simple and intuitive. I am also very proud of our team. We work insane hours to make sure we are adding the necessary features to our product so we can fulfill our promise to our customers. We are able to innovate very efficiently and are able to build out our product in ways that keeps new features well integrated and intuitive, as opposed to just slapping things on top of one another. One of your main messages is the idea of “counselor as entrepreneur.” Why is it important for solo health practitioners to think of themselves as entrepreneurs? What are some ways that they can get into that mindset? I don’t think this is limited to solo practitioners; it applies to anyone in any setting. I think the message that “you are an entrepreneur” provides the necessary reframe for this community. Being called to this special work is a gift, but that doesn’t mean this melding of art and science is not a business. It is very much a business, and one cannot survive and thrive by ignoring that. I want these health and wellness practitioners to embrace the business part of their practice and understand that as an entrepreneur/small business owner, there are things they can do to have greater success - and that that's ok.
One of our interests here at Private Practice Toolbox is helping counselors generate income in ways other than seeing clients. We’ve talked about speaking, writing, and teaching, but as of yet haven’t discussed software creation and development. Is there any specific advice or insight you can offer to tech-savvy clinicians thinking of venturing into that realm? The first thing that comes to mind is that developing software is a lot harder than it looks. There is so much detail work that has to be attended to, and there is no gray area; software is black and white. There are so many use cases for something as seemingly simple as recovering a lost password. For example, do you click on a ‘forgot password’ link and then send the user to a page to enter some information - what information? What if the user enters it wrong? Is there an error message? Where? What does it say? The list goes on…and on…and on. I don't say this to be discouraging. I say it because based on my experience talking with customers, most don’t realize the work it takes to develop even mediocre software. So my advice is this: If you have an idea, by all means, pursue it. If it’s software-related, then find someone to work with who has experience developing software. And be prepared to spend money on good developers and designers. My mom has this great saying: “Cheap is expensive.” When it comes to developing software, especially software in the health market where there are significant security requirements needed to protect patient health information, don’t be cheap. To recap: Follow your dreams and passions, and if that happens to be developing software, then understand the costs of time and money it takes to develop something valuable. Not only do you have an innovative software program, but through your company blog, you are also involved in educating clinicians on how to best run their practice from a business standpoint. Why is it important for you to share your wisdom and skills? Because I am incredibly passionate about this work. I have some insights into this field because I trained as a clinician, and I want this community to embrace the business side of their practice. The services clinicians provide are invaluable, and they should be well compensated for all the time they put into getting educated and trained. The more they think of themselves as entrepreneurs, and the more they can see the parallel between other industries and theirs, the more it will help them. I think I have more to offer than just a great software product, and if I can help clinicians, even ones that don't use SimplePractice, then that is awesome. Howard Spector is the CEO and Founder of SimplePractice. He has years of experience creating and developing technology companies and was the creator of TrackYourHours.com. He has a MA in Psychology from Pacifica Graduate Institute and a BA from he University of Southern California. 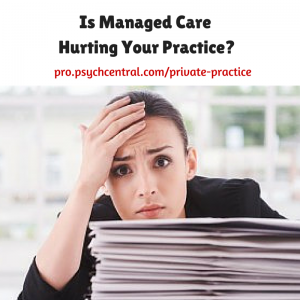 Managed care panels have a way of micromanaging you in a supposed attempt to make you accountable. This means that a therapist often has less say and control in the type, length, and modality of treatment provided to the client, who has also has less input in the process. Think about it: an outside, commercial middle-man is dictating how you, the professional, help your client. It's easy to see how such a system lends itself to inadequacy and substandard care. The mandatory diagnosing of clients is arguably the most deplorable part of using managing care panels. You are often required to provide a diagnosis, even if you do not believe your client has one. Even worse, some companies only accept certain kinds of diagnoses, which only further restricts your ability to provide ethical and accurate information and care. Communicating with managed care companies is a nightmare. There's excessive paperwork to fill out and phone calls to make. The hassle is never-ending, and it takes away from what you want to do: use your professional skills to serve your clients. Not only is your business inefficient and time-consuming to operate, but by looking at the math, you'll discover that your overall costs are increased as well. Even analyzing things solely from a business perspective, it's evident that using managed care is not a desirable model. When working with managed care their contracted rates were 40-60% of my full fee. Not only was there a low fee, but there was also the frustration of denied or delayed payments. There would sometimes be problems with the paperwork, or things would get lost in the tedious communication, and I wouldn't get paid for weeks or even months. I wasn't being sufficiently compensated for my work, and I wasn't always being paid in a timely manner. It was disheartening to say the least. It is emotionally and financially draining, and we deserve better. These are three of the major ways managed care can hurt your practice (although there are certainly more). Thankfully, there's a better way. A way you can work less and earn more. I'm excited to share you with in upcoming posts about how transitioning to a fee-for-service model helped me build a thriving practice. Click here to access my webinar, "Breaking Up With Managed Care" to learn even more tips and strategies.